chrisNova777 wrote: i just saw a listing for one of these on ebay-- never heard of this interface untill just now.. is it a recent development? Recent, yes. They've only been available for sale for a few months now. There are some prototype boards that have been in the wild a little longer as well. It works!! Thanks again, ab0tj. Maleckii wrote: It works!! Thanks again, ab0tj. Glad to hear it! And thanks for the review as well. I just wanted to give a quick thank you for this project. I bought an MT-32 over 15 years ago without understanding that it wouldn't work with the MPU-401 interface on the SoundBlaster. Real MPU-401 cards have gone for crazy money on eBay even back then, so the module just sat in a box while I tried to get something working. I have an ISA perfboard and an old PIC with some latches. I just didn't really know where to start with the software part, and so it eventually went into the same box. I ran across HardMPU on eBay, found this thread, and decided what the heck. It works great! This saves me so much time. 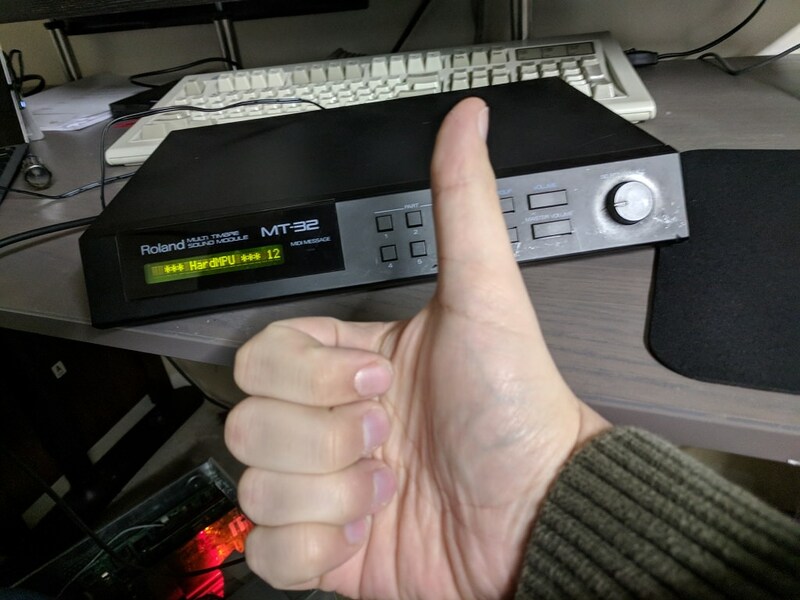 Prices on MT-32s and SC55s have been on the rise since YouTubers like LGR started talking about them recently (that's what reminded me about my MT-32). With the MPU-401 problem largely solved, it will for sure remove that bottleneck on demand. I recently picked up an SC-88 for a decent price, but they are going up now too. Anyway, thanks again! I just heard Wing Commander through the MT-32 for the first time. So much better! rknize wrote: ... understanding that it wouldn't work with the MPU-401 interface on the SoundBlaster. Sorry just pedantry I know but it does work with the SoundBlaster MPU-401 in most cases, and the few that don't ("intelligent mode" games) you can use SoftMPU to get around. Glad you've found a solution you like all the same! True, but there was no SoftMPU 15 years ago. In fact, I didn't even know about SoftMPU until after I found HardMPU. Except for games which support MT-32 but are incompatible with EMM386. gdjacobs wrote: Except for games which support MT-32 but are incompatible with EMM386. Sure! How many are we talking? I was being a bit pedantic to your pedantry. U7 supports MT-32 without requiring intelligent mode. I'm not sure about Comanche. At the moment, I'm not looking for trouble, so I'm reluctant to spend a lot of time checking around. gdjacobs wrote: I was being a bit pedantic to your pedantry. Thank you for this project ab0tj! I tested a few games on my P133, and it works flawlessly. crystal oscillator, fast rising time”. I took a normal fuse at position F1, not very elegant, but it does the job. Does anyone know a source for those slot brackets in Europe? They are in al kinds of types. I used mine from an ISA VGA card. Anyone has 1 for sale? Its a great anyway. Hilarious! Thrax wrote: Anyone has 1 for sale? I've been away from this for a while dealing with some life changes. I have bare boards available and will be listing some more built boards on eBay soon. Unfortunately right now I don't have time to be putting kits together or to be building boards to order. For those who don't know this is the IBM Microchannel version of the MPU-IPC-T. With this information is it at all possible an MCA version of HardMPU could be made? TrekkiesUnite118 wrote: For those who don't know this is the IBM Microchannel version of the MPU-IPC-T. With this information is it at all possible an MCA version of HardMPU could be made? Doesn't look especially difficult. When life calms down a bit (in the next month or so probably) I may have to look at getting a microchannel based machine to play around with. Between comparing the schematics of the MCA and ISA based cards and some logic analyzer time I bet it could be done. The address and data lines are there, just gotta figure out what is going on with the control lines. Wasn't MCA both 16-bit and 32-bit bus for certain IBM PS/2 systems from the late 80's early 90's? According to Wikipedia, the card superseded the ISA architecture, while the PCI architecture superseded the MCA bus in 1993. I could be mistaken, though. Basically it looks like once you get to to the CMOS gate array the cards start to line up. So I'd imagine if the few differences between those chips could be figured out a port wouldn't be too hard to do. Hmm, actually after looking at the bus spec and the MPU-IMC schematic, this looks deceptively simple. The biggest worry I had was implementing the automatic configuration stuff, but it seems that Roland just provides a card ID to the system and otherwise doesn't support "soft" configuration the I/O address or IRQ. If that is true, it should only take a GAL or two to take care of the differences between MCA and ISA. I don't see MCA prototype boards available online, so I'd probably have to build some sort of bus breakout board first. Well, that and I don't have a PS/2 system to play with. ab0tj wrote: Hmm, actually after looking at the bus spec and the MPU-IMC schematic, this looks deceptively simple. The biggest worry I had was implementing the automatic configuration stuff, but it seems that Roland just provides a card ID to the system and otherwise doesn't support "soft" configuration the I/O address or IRQ. If that is true, it should only take a GAL or two to take care of the differences between MCA and ISA. If you need people to help test I'm sure volunteers could be found, myself included. Whats the difference beetween HardMPU and Music Quest ? Both to the Same Job right ?